Gum disease is a serious issue affecting millions of American dental patients. Gum disease can have severe consequences when it is not treated appropriately and early with general dentistry. Lawrenceville Family Dental Care offers effective treatment for gum disease to patients in Gwinnett County. Our comprehensive dental practice treats patients of all ages, because people can be affected by gum disease at any point in their lives. Our dentist, Dr. Ashish Patel, is highly experienced and knowledgeable in treating different types of gum disease and at their varying stages. If you need treatment for gum disease, please contact Lawrenceville Family Dental Care to schedule an appointment with Dr. Patel. The sooner you seek treatment for gum disease, the sooner your mouth can be restored to full health. The number one cause for gum disease is improper oral health care. While brushing your teeth twice a day is important, flossing your teeth once a day is even more important. Floss is the only tool that can remove bacteria-laden plaque buildup from the gum line. If you are not flossing on a daily basis, your mouth is incredibly susceptible to gum disease. These symptoms should never be ignored! 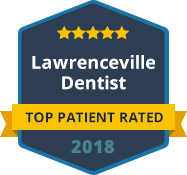 Dr. Ashish Patel provides expert care to patients at Lawrenceville Family Dental Care, and we urge you to contact us as soon as possible if you are experiencing any of the symptoms of gum disease.